HIT Supplements has created a monster with Igniter Extreme. Or they just created a men's pre workout and slapped a black and pink label on it. Either way- they made a supplement that works. But let's define works. 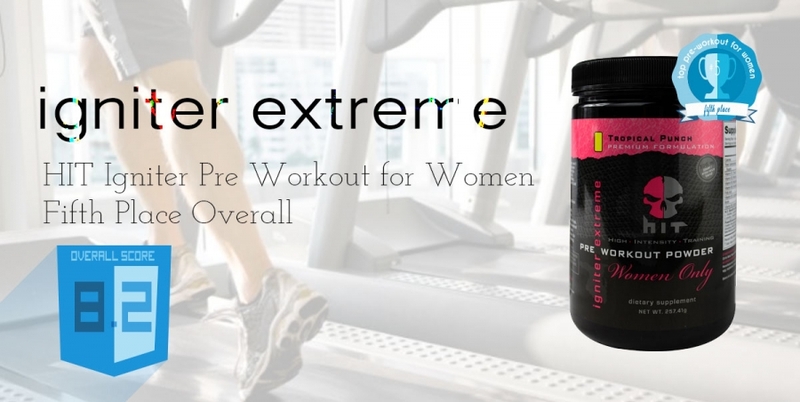 If you're doing some pretty serious lifting- then Igniter Extreme 'women only', works. After going over the supplement facts panel in depth with the BPW4W squad (yes-my 'fitties' and I :P), we came to the conclusion that in order to give this product the fairest shot at cracking the BPW4W top 10- we had to unleash Igniter Extreme during heavy weight day. My heaviest weight day is my Tuesday- a bear of a workout that I do just once a week because I'm honestly sore for days after. The meat of the workout is a RPT-style squat scheme- 6 sets of heavy back squats starting with lower volume and heavier weight- gradually adding reps while dropping lbs. I broke into the Igniter Pre workout about 35 minutes before my workout because I wanted to give the active ingredients plenty of time to get into my system. The pina colada flavor was quite tasty- a far cry from a freshly made one that you get poolside (you know the one I'm talking about- with the 'island oasis' mix?? ), but it had a nice tropical taste non-the-less. The mixability wasn't great, but that's to be expected from any supplement containing the BCAA Leucine. Igniter Extreme takes about 30 minutes to really set in. I got the familiar beta-alanine tingles about 20 minutes after finishing my last sip- and I knew it was almost time to crush the weights. Surprisingly, the beta-alanine dosage isn't quite as strong as it is in Fitmiss Ignite, but then again, we'll never know for sure because they are both in proprietary blends. After a good treadmill warm-up, I got right into my squats. My first sets were really tough as usual. The last 3 are where I feel the product helped out tons. My explosiveness and ability to power through the final reps of each agonizing set were absolutely higher than they would have been without this pre workout for HIT. I felt 'the pump'- no matter what your stance is on its effectiveness- it definitely is present when taking IE for women. I wasn't surprised by this, given the presence of both Citrulline and Creatine. The remainder of my workout is a routine of supersets, hitting the shoulders in conjunction with hamstrings and finally some isolation moves for my skinny quads. I loved Igniter for this portion of my workout especially, as my muscles got primed and full- allowing me to move more weight in less time than I ever had without a pre. I left the gym feeling, well, beastly. In a good way though! As a reader of this blog, you know that we tell it like it is with all supplements. There is give and there is take. We give it to Igniter Extreme- it's a tremendous pre workout for improving strength and explosiveness. This decision was unanimous among the six testers. Now it's time to lay down the bad and the ugly. Igniter Extreme is, well, a men's pre workout. I said it. All the testers said it. And to be honest- I don't think HIT would even deny it. In fact, they don't. The supplement facts panel on their website on the IE women only page is identical to the original/men's IE. We've seen pre workouts for women that are comparable to men's formulas, but never a straight up clone of the men's formula! This is a weird business decision from the folks at HIT- why label something as women only if its literally the same thing as the men's formula? It's a little insulting that they don't think people can plainly see that the two products are the same. In addition to being an exact replica of HIT's Igniter Extreme men's formulation- there are a couple other issues we have with the product. First of all- the creatine. Yes it's the most effective muscle building supplement in the history of sports supplementation. It works by function of increasing ATP levels at the cellular level- meaning that you have a longer short-burst amount of energy before the body starts oxidizing substrates to turnover the ADP back to ATP (we can get into the science more in depth another time- but you get the point). Where I'm going with this is that creatine increases cellular volume and capacity. The cells hold more water, and appear more full as a result. That's why you hear of people putting on lbs. very very quickly when taking creatine. This is all well and good if you are a competitive athlete, power lifter, or someone who has the primary fitness goal of getting as big and strong as possible. But if this IS NOT your goal, creatine will simply add lbs of perhaps unwanted bulk to your frame.